In this section you can find useful resources and documents on minority languages and training in Europe. In the 21st century all European citizens live in a multilingual environment. In their daily lives they come across many different languages. Consequently there is a growing interest in multilingualism and an increasing need for language communities to exchange experiences and to cooperate. The Mercator European Research Centre on Multilingualism and Language Learning, part of the Fryske Akademy, meets this need by collecting, researching and studying, circulating, and applying knowledge in the field of language learning and use at school, at home and through cultural participation. The Mercator Research Centre is an independent and recognised reference centre for policymakers and professional workers in the field of multilingual education and language learning. The Mercator Research Centre brings Europe to Fryslân and Fryslân to Europe. 3-year network (January 2014- December 2016) supported by action KA2 Languages of the Lifelong Learning Programme, European Commission. An interesting thesis on Multilingualism in nursing homes in Friesland by Nynke-Boudien Plat. Previous research has shown that the quality of communication and language use in health-care institutions determines the quality of wellbeing of elderly. 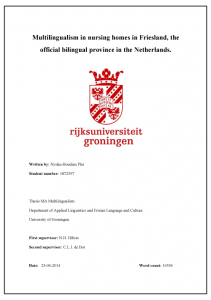 The current study focuses on multilingualism in nursing homes in the only official bilingual province of the Netherlands, Friesland. Observations of language use in different situations and domains and linguistic landscapes were made in four nursing homes from different municipalities. Nurses and activity coordinators were interviewed via a questionnaire to gain more insight in their attitudes towards language and the mother tongue of clients. This is a book about the role of language in the integration of migrants. 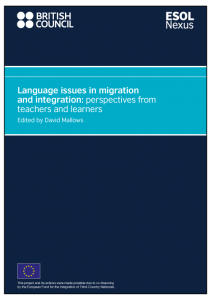 The writers of the chapters are all engaged in the education of migrants as teachers, researchers or policymakers in a wide variety of contexts and they provide us with a rich and thought-provoking array of perspectives from teachers and learners on language issues in migration and integration. Through them we hear directly from learners, migrants who have arrived in a new country and are now striving to master the host language. We learn much from them about the place of language and language learning in their new lives. Throughout this year an array of activities have been arranged by the cardiff and the vale of glamorgan Welsh for adults centre, teach minority ethnic groups about Welsh language and culture. A Welsh Day was held in the Friary Centre in Cardiff City Centre on St David’s Day, where more than 70 ESOL and Skills for Life students took part in several Welsh taster courses with Gwennan Higham, Development Officer and Tutor at the Welsh for Adults Centre. Those who took part learnt Welsh greetings and useful phrases through different activities, including a workshop and quiz by Gareth Bonello from St Fagans and Cardiff Library. 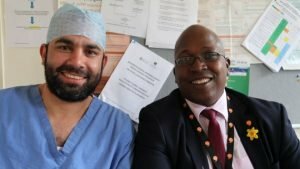 Do immigrants to Wales have enough opportunity to learn Welsh? Immigrants to Wales are barely aware that Welsh exists, according to one AM. But as new arrivals across the UK face pressure to learn English, is there the same interest – and opportunity – for migrants to Wales to learn Welsh?